Nora was VERY excited to help me bake a pie — but I wasn’t as excited to bake one. So I decided to use up the lone Chocolate Graham Cracker crust that had been sitting in our pantry for the last several months. 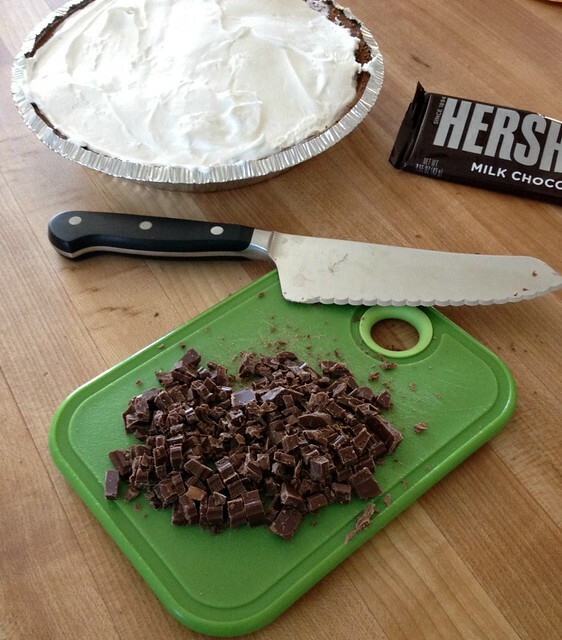 I didn’t have much time for baking that day and chocolate sounded really good to me. 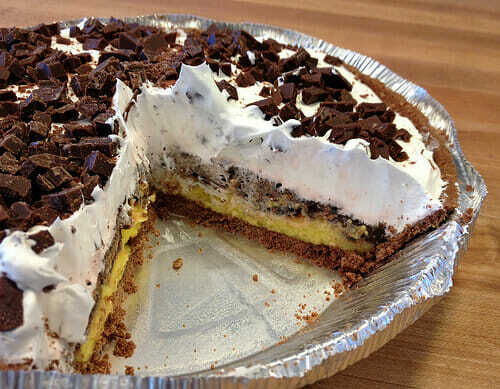 So, a spur-of-the-moment decision was made and in less than 10 minutes (no lie) I had a triple-layer no-bake pudding pie in the fridge. And let’s just say EVERYONE in our house thoroughly enjoyed it for dessert later that night! Not only did it taste delicious, it was extremely quick and simple to make, and I only got one small bowl dirty in the process! 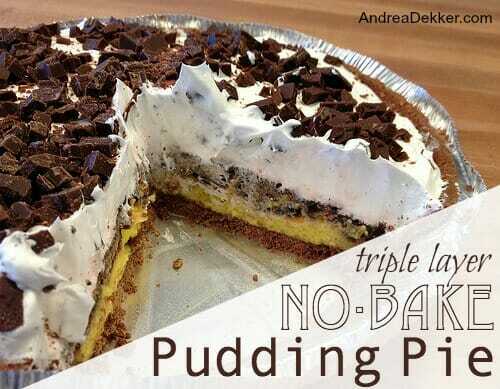 If you’re looking for a refreshing no-bake dessert for tonight (or right now), give this triple layer pie a try. 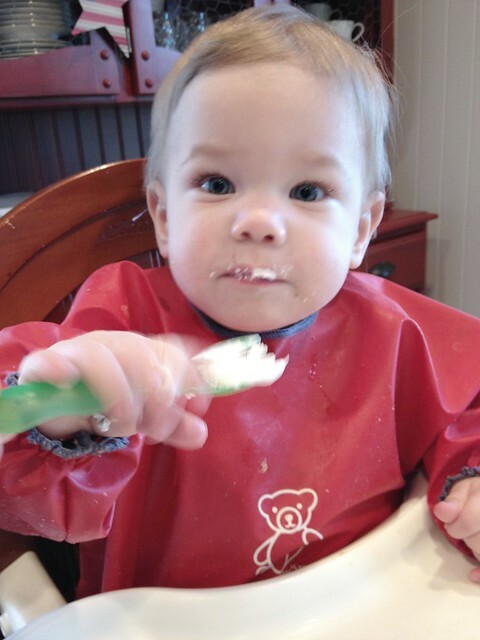 Everyone kept raving about how yummy this pie was… even Simon continually grunted and held out his fork for more! 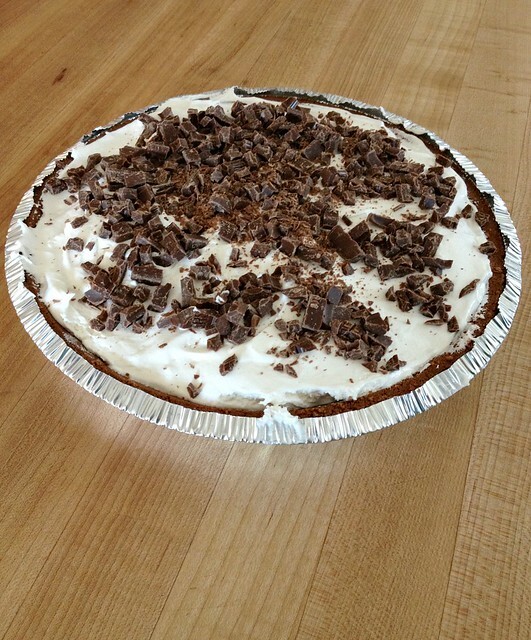 I certainly plan to make this recipe on a more-regular basis — especially now that the weather is warming up and refrigerated pies sound even more yummy. 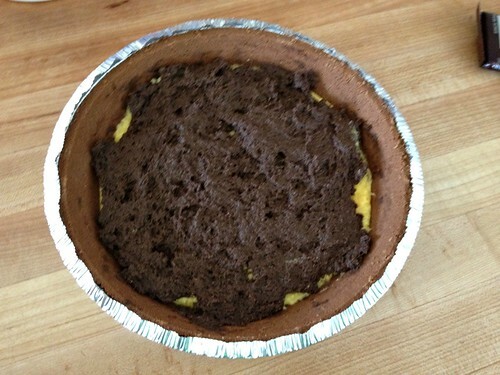 In fact, I think the next time I make it, I’ll try popping it in the freezer to see how it tastes as a frozen pie! 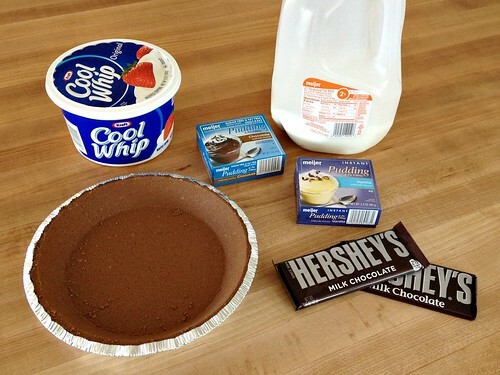 Has anyone tried freezing this pie? I would be interested to see how it worked out. yes, you can definitely freeze it — just make sure to take it out of the freezer about 15-20 minutes before you are going to serve it, otherwise you won’t be able to cut it! I may or may not have snuck out to the store with my 9 mo. old right before dinner tonight to buy the stuff to make this. 🙂 It’s currently chilling in the fridge. Reading your blog post before dinner was like going to the grocery store hungry — dangerous! Thanks for the easy chocolate option. 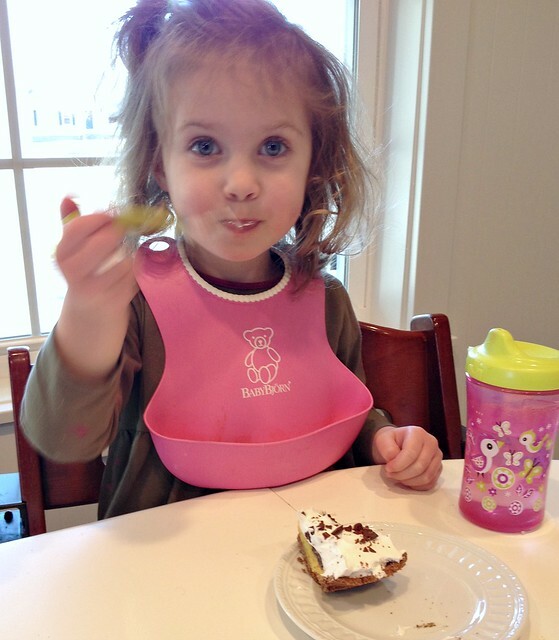 yes, she loved the pie and was very excited to eat it! Planning to make a homemade carrot cake and lemon meringue pie for Easter. I needed something easy that had chocolate and this fits the bill perfectly. Thank you! 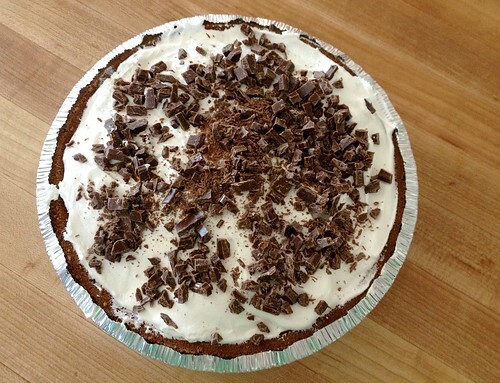 yes, this would be the perfect addition to your delicious list of pies! 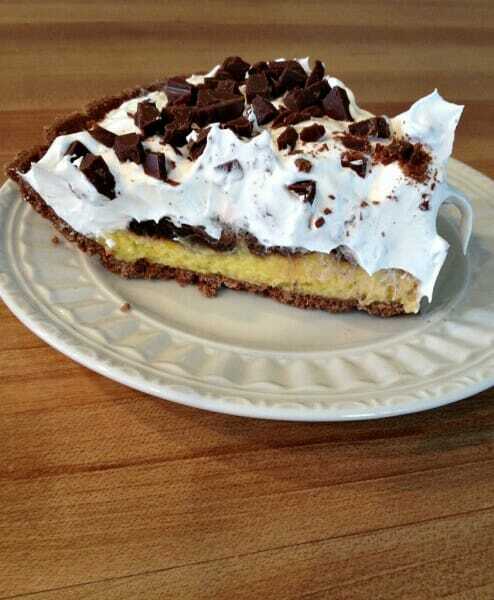 On PI day I made a family heritage pie I hadn’t made or eaten in years. It’s called a Jeff Davis pie named for the President of the Confederate States, I guess, but I don’t know. I think it came with my grandmother’s people when they left North Carolina after the Civil War going to other Southern states trying to escape areas where the war ravages were the worst. Anyway, they ended up here in Northwest Arkansas where most of the family stayed. 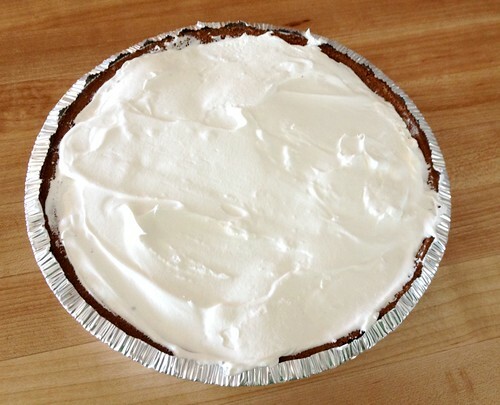 I have seen other similar versions of this cinnamon, cloves, nutmeg cream pie, but I like my mama and grandma’s version the best and it doesn’t need the oven. 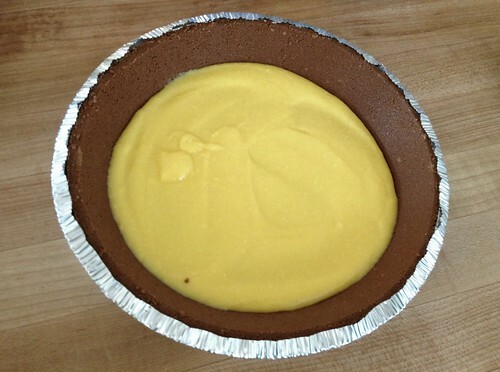 Looks like a yummy Boston cream pudding pie! We trid two of your recipes this week to great success, the slow cooker mac and cheese and cheese danish from crescent rolls. Both were huge hits, and I expect this will be too. Thanks! Ooooh, yummy!! This would definitely be a crowd pleaser at our house. Our favorite pie is strawberry pie. A little more involved but the results are delicious!!! Yup, Strawberry pie is actually one of my favorites too — but only in the spring and summer when the strawberries are really fresh and delicious!